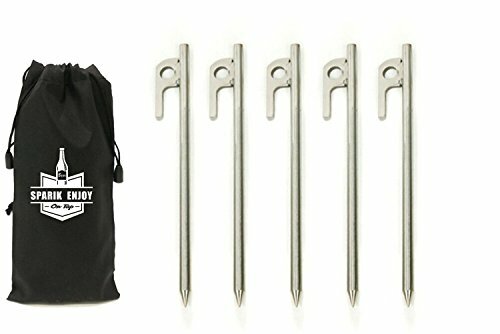 Forged Steel Burly Tent Solid Stakes Casting Pegs can be pounded into the ground without bouncing off rocks. Actually, the rocks will be crushed. In fact, you could pound these into concrete if you wanted. They're really that tough. A flat head minimizes slipping while hammering, while a hole in the head makes extraction a snap. Specifications: Length: 8-inch Diameter: 0.39-inch Total Weight: 2.4 lb Color: Black Material: Forged S45C Steel Package Includes: 10 X 8 Inch Forged Steel Burly Tent Solid Stakes Casting Pegs Installation: 1. Put the stake at a 60 degree angle with the ground, and keep the hook in the head of the stake facing the ground. 2. Beat the stake with a tent hammer into the ground and leave about 1.5 inch height out. 3. Fasten the tent rope into the hook in the head of the stake. If you have any questions about this product by SWONVI, contact us by completing and submitting the form below. If you are looking for a specif part number, please include it with your message.